Boscobel Public Library: At Your Library This Summer! At Your Library This Summer! 2018 Summer Library Reading Program, "Libraries Rock!!" Calling all kids ages 3-12 and families, this week kicks off the 2018 Summer Library Reading Program, "Libraries Rock!! ", taking place every Wednesday from 10 to 11am, June 6th thru July 27th in the downstairs clubroom and outside at the Lion's Gazebo. Get ready for a whole parade of great music-themed activities, special guest musicians, reading challenges and clever DIY music makers' crafts!. On-site registration will be available and is required for all families. Parents with toddlers and infants will be able to join in a drop-in DIY "Rubber Ducky" Club early literacy program with Jenni Lund upstairs in the children's room. We are seeking parents and grandparents to volunteer as program helpers on Wednesday mornings from approximately 10 to 11:30 am. Please call the library at 608-375-5723 to volunteer or to learn more about the program. Annual Big July Booksale takes place the week after the 4th of July, from Thursday 7/12 thru Saturday7/14. The library is now accepting donations of all kinds of gently used books, recent magazines, DVDs, and audiobooks. If you have a large amount to donate (more than two grocery bags), please call the library first before bringing in your donations. Booksale volunteers are needed and shift sign-up sheets will be available at the library starting this week. Calling all history buffs to join us at the library for a fun and informative evening exploring Boscobel’s past. Boscobel Public Library History Club meets this Thursday evening, June 7th at 6:30 pm in the downstairs clubroom of the library. Our new archive space will be open and we'll be discussing a variety of local history topics. Topics for June include: And Then It Was Gone, Lost residential and commercial buildings in Boscobel, especially any with unusual stories attached to them. Please bring photos, memorabilia, scrapbooks and stories to share (40 minutes). 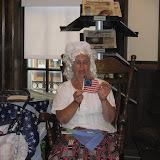 Show and Tell: ten minutes each for people to bring in historic items or collections to share and discuss, and to ask questions about any topic related to local history (30 - 40 minutes total). Wrap Up with the Monthly History Mystery question for our next meeting: historic Boscobel hospitals, where they were originally located and memorable people associated with them. History Club is open to the public and we encourage anyone curious about local history or the club to drop in and attending a meeting. Frieda's Readers Adult Bookclub meets at the library on June 19th, 7pm, upstairs. This month's read is Ivan Doig's, The Bartender's Tale. The book is available for checkout at the library. Bookclub meets the third Tuesday of every month and is open to the public; everyone is welcome to attend, new members and guests are very welcome! For additional information about these programs or other library services, please feel free to stop by or call 608-391-0611. Find us on Facebook at the Boscobel Public Library page.